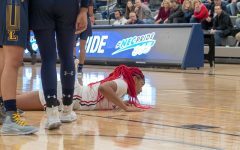 MOON TOWNSHIP — In an early Tuesday morning match up against Delaware State, Irekpitan Ozzy-Momodu of the Robert Morris women’s basketball team knocked in a basket as time was winding down to give the Colonials the 64-63 victory. The win by itself was thrilling but the fact that this bucket made head coach Charlie Buscaglia the fastest coach to 50 wins in RMU women’s basketball history, was just the icing on the cake. These 50 wins have been highlighted by two NEC Coach of the year awards, two NEC regular season titles, one NEC tournament championship, one NCAA tournament appearance and one WNIT tournament appearance. That’s a lot for just over two years of coaching. So in honor of Coach Buscaglia’s accomplishment, RMU Sentry Media has decided to look at coach B’s top five wins so far as the head coach of RMU women’s basketball. #5 – January 21, 2017 – RMU vs Bryant – The beginning of “The Streak”: During coach Buscaglia’s first season, the team sputtered out of the gate, starting 3-3 in conference play and looking as if they were on pace to live in the middle of the standings in the NEC. 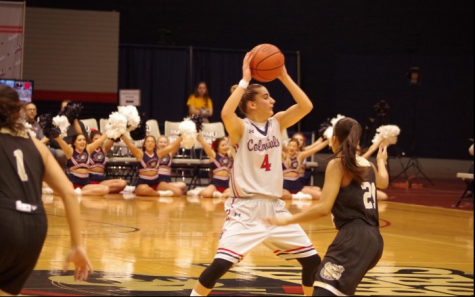 The Colonials had just come off their most brutal home loss of the season falling 70-55 to the Saint Francis Red Flash in a game that had been completely dominated by the now all-time leading scorer in NEC history, Jessica Kovatch. The Colonials needed a win badly to keep pace in the conference. After holding just a 18-17 lead in a game where both offenses struggled, the Colonials came out after halftime firing on all cylinders. Led by all-time RMU great Anna-Niki Stamolamprou, Robert Morris outscored the Bulldogs 44-29 in the second half en route to a 62-46 victory. After this game, the Colonials would proceed to go on a nine-game winning streak, still the longest in Coach Buscaglia’s career as head coach. That winning streak would single-handedly allow the Colonials to claim the NEC title. #4 – January 8, 2018 – RMU vs St. Francis Brooklyn – Defense puts up a record-breaking show: In a mid-season conference matchup, the Colonials defense showed just how dominant they could be. During the 2017-18 season, RMU displayed one of the best defenses in the entire nation, but that incredible defensive season was highlighted when they allowed just one single point in the first quarter against St. Francis Brooklyn. That would be good enough for the fewest points allowed in a quarter in school history. Through three quarters, the Colonials had allowed just 15 points and despite a 21 point fourth quarter from the Terriers, allowed just 36 points, their fewest allowed since the NEC quarterfinals against Fairleigh Dickinson the year before. The Colonials were so dominant in this match up that the score sat at 31-8 at halftime in favor of Robert Morris. In total, the Terriers shot a mere 28.2 percent (11-for-39) from the field, shot 17.6 percent (3-for-17) from three-point range and committed 19 turnovers on the day. All of this while the Terriers came in as the 12th best three-point shooting team in the nation. #3 – March 8, 2018 – RMU vs LIU Brooklyn – Buscaglia breaks record for most wins in a single season: With a trip to the NEC championship game on the line, the Colonials hosted the LIU Brooklyn Blackbirds, a team they had beaten twice that season already. 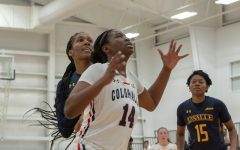 It was clear that the Colonials came ready to play in this one, outscoring the Blackbirds by double digits in each of the first three quarters to take a 64-31 lead going into the final quarter where they would eventually win 74-44. But what was significant about this game wasn’t the trip to the NEC championship game or the dominant victory. 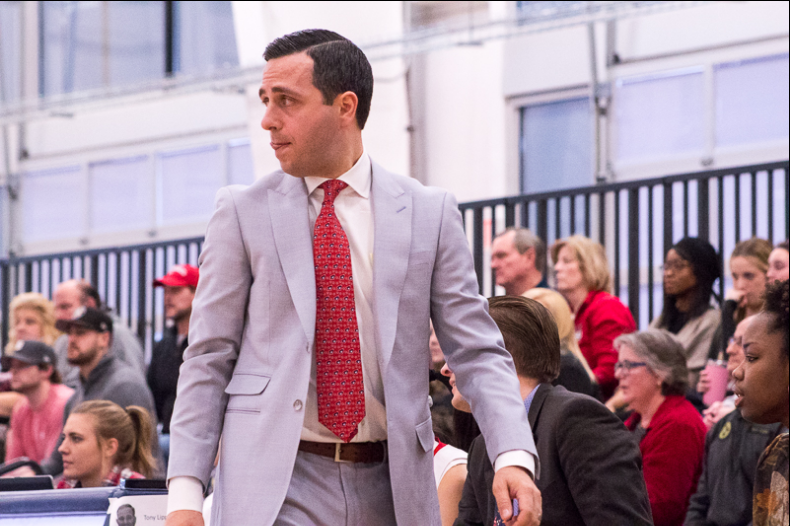 It was that Coach Buscaglia had coached his team to a 25-win season, the most wins accumulated in school history. In just his second season, Coach Charlie Buscaglia has won more games in just one season that his father Sal had done in his entire 13-year career with the Colonials. Considering all the things that his father accomplished in building this women’s basketball program, that amount of victories was no small feat. 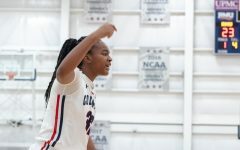 Despite not winning in the NEC championship game, the Colonials’ epic season would still earn them a berth in the WNIT tournament to play the Drexel Dragons. #2 – March 12, 2017 – RMU vs Bryant – NEC Championship Game: Coach Buscaglia had just been named the NEC coach of the year in his first season while his star senior Anna-Niki Stamolamprou claimed the title of NEC player of the year. The only thing left between them and the NCAA tournament was the NEC championship match up against the Bryant Bulldogs. Even more significant, this game would be the final one in the history of the Charles L. Sewall Center as it was being torn down to build the brand new UPMC Events Center. And what better way to say goodbye to an arena with so many incredible moments that with yet another one? It was a dominant second quarter, in which the Colonials outscored the Bulldogs 15-4 which put Robert Morris in control early in the game, taking a 33-16 lead into halftime. The 16 points scored by Bryant tied a season-low for points allowed in a half for RMU. From there, Bryant was helpless to any sort of comeback as the RMU crowd would storm the court as the clock hit zero. Coach Buscaglia would hoist his first ever NEC championship trophy as head coach of the Colonials. Stamolamprou was given her second NEC Tournament MVP while Megan Smith was named to the All-Tournament team. It was a moment that would forever be remembered in the history of RMU women’s basketball. The Colonials would go on the play the Notre Dame Fighting Irish in the NCAA tournament, where there historic season would ultimately end. But for Coach B and the rest of Colonial Country, it was certainly a win to remember. Rivalry has certainly reached its all-time high of intensity this past season with both Robert Morris and Saint Francis being by-far the top two teams in the Northeast Conference. Both teams came into this match up with an undefeated conference record, looking to take control of first-place in the conference. And it was certainly a match up to remember. The Red Flash narrowly outscored the Colonials in each of the first three quarters but took just a four-point lead going into the final frame of play. Saint Francis went up by their biggest margin of the afternoon, taking a 9-point lead with 6:32 remaining. From there, Robert Morris would begin a 15-5 run that would stretch until the end of the game leading up to the biggest moment of perhaps the entire season. With the Colonials down by two points and 17.5 seconds remaining, the Colonials tried to draw up a play for the final shot of the game. With 1.8 seconds left in the game, freshman Nina Augustin sent a desperation pass to senior Megan Smith who fired off the three-point shot just before the clock hit zero. 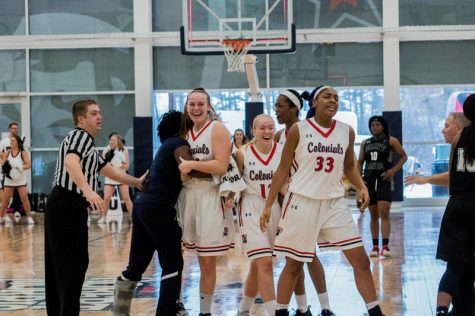 The shot went in and the crowd went absolutely wild as the Colonials knocked off their biggest rival in the most thrilling fashion imaginable. Despite 42 points from SFU star Jessica Kovatch, the Colonials pulled out their greatest win.